@BifBangPow: Get your GEEK on and Boldly Go! Get your GEEK on and Boldly Go! Hey folks, Jolly Jason Lenzi comin' at ya again, with more proof that the world is holding Bif Bang Pow! ever closer to it's collective bosom. It's been a while since I've written, but trust me, with all we have going on in the next few months, you'll get plenty sick of my witty prose soon enough. 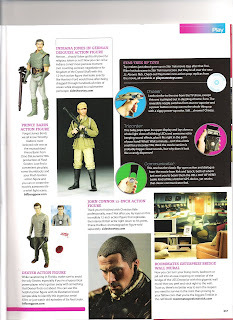 First news item is, not one, but TWO of our new figures making the PLAY list again in GEEK Magazine! You read that right, the latest and greatest issue of the coolest magazine on the stands, the one that's all about the NEW 'Star Trek' flick and has JJ Abrams on the cover, features our very own Prince Barin and Dexter Morgan figures, facing off with Indiana Jones and John Connor! I mean, I love Indy, and we all know what a temper Mr. Bale has, but I think Barin's laser rifle (and spiked-platform fighting skills) and Dexter's, well, killing compulsion, would have the edge in an all out war. But heck! Let's just grab the new 'Star Trek' phasers featured on the same page and make it a free for all! So, my advice: before it all kicks off, I'd boldly go over to Entertainment Earth and order Barin and Dexter, because soon it'll be too late. You have been warned.